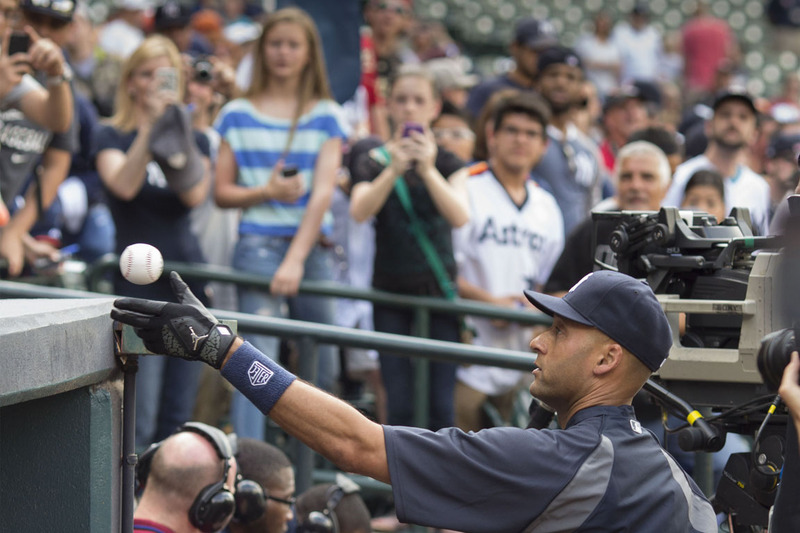 Derek Jeter got his 3,317th hit, got plunked, and got his final season started. Nolan Ryan threw to Craig Biggio, and Scott Feldman threw like every Houston fan hopes he will again. Dexter Fowler got it all started for Houston with doubles in his first two ABs as an Astro, Jesus Guzman went deep, Jose Altuve pestered the visitors and they were happy in Texas. Now every team has played a regular season game and nobody is 0-0 in the Standings. 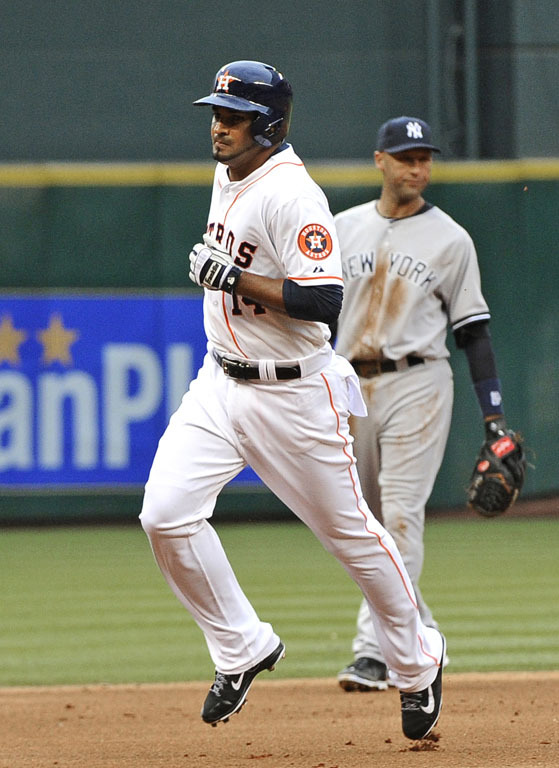 We have all the firsts . . . .
Astros 6, Yankees 2. WP: Feldman (1-0). LP: Sabathia (0-1). First win for the Astros in 16 games dating back to last season, as they lost their last 15 in 2013. First “go with the shift”: Teixeira aims for the left side and the seeing-eye base hit brings in Jeter with his first run of the season. It’s 6-2 in the eighth. First Yankees run: Brian McCann gets his first hit with New York and Ellsbury scores his first run as a Yankee, a single to left that makes it 6-1. First Jeter hit of 2014: Classic oppo single to right off reliever Chad Qualls in the eighth. With that hit, Jeter moves within two of Paul Molitor on the all-time list. It’s No. 3,317 in a great career. First Yankee call to the bullpen: Dellin Betances replaces Sabathia after the starter went six innings, giving up six earned runs, eight hits, walking one and striking out six. Sabathia threw 99 pitches and yielded a pair of longballs. Betances was lights-out in a 1-2-3 inning, retiring the top of the Astros’ order. First Bo Porter hook: Feldman gave the Astros 6 2/3 brilliant innings, two hits, two walks and three strikeouts, throwing 102 pitches. Lefty Kevin Chapman replaces him with the bases loaded and two out in the seventh, and gets out of the jam by inducing Kelly Johnson to drop a comebacker for a force at home. First time Sabathia stops Fowler: Strikeout on three pitches in the fourth, following doubles in Fowler’s first two at-bats as an Astro. First Yankees hit: Carlos Beltran single to left with one out in the fourth. First camera shot of Reggie Jackson and Ryan sitting behind the plate, one seat between them. Oh how we would love to see that batter-pitcher matchup again on Opening Day. Also first game for former President George H.W. Bush and First Lady Barbara Bush. Great to see them out there again! First Astros home run: Jesus Guzman crushes a two-run shot off the facade in left-center to make it 4-0. First Astros run: Jose Altuve grounds a ball through the left side past a diving Jeter and scores Fowler from third for a quick 1-0 Houston lead. It comes on an 80 mph 1-2 slider. Altuve goes from first to third on a wild pitch and then scores on a grounder to first as Mark Teixeira throws it in the dirt at home (wouldn’t have gotten him anyway). Brutal inning for Bombers. First Astros hit: Dexter Fowler makes his Houston debut with a leadoff double in the bottom of the first off CC Sabathia over the head of Ellsbury onto Tal’s Hill in center. First pitch: Scott Feldman to Jacoby Ellsbury at 7:13 p.m. ET, resulting in a fly to left. Both players are debuting with new clubs. Ceremonial first pitch: Nolan Ryan. The Ryan Express was re-introduced to the crowd in his new capacity with the Astros’ front office. Craig Biggio, who was a couple votes shy this year of joining Ryan in the Hall of Fame, did the honors behind the plate. All we can say about Nolan’s wild pitch was, it’s a good thing it wasn’t the 1980s with a righty batter up there! For those who love Opening Day, here’s a cool opportunity to keep some of it for yourself . . . I just wrote about 70,000 words, told more Opening Day stories than any single book ever had, built what was essentially a living e-book over months, and as of moments ago all 30 teams finally have a win or loss. It started with a countdown on Jan. 31 at 51 days till Sydney (featuring Ichiro), and became a liveblog through the MLB Opening Series, Sunday’s Opening Night at San Diego, 13 Opening Day games, and then a final Tuesday Opening Day game marking the start of Derek Jeter’s farewell tour. See all the firsts on Grand Openings, MLB.com’s official Opening Day blog, at openingday.mlblogs.com. Derek Jeter was my role model.